They are teenagers whose experiences with suicide are so vivid and gut-wrenching that you may flinch to hear them, and maybe wish you hadn’t heard them at all. Yet, a group of Billings high school kids have bared their souls in a script they have written based on their own experiences. They will perform the script Jan. 24 at the NOVA Center for the Performing Arts. Their stories are real; the names have not been changed to protect the innocent. Hunter Hanson, a 17-year-old junior at Senior High School, said she has had to stop a friend from killing herself at least four times. On Sept. 13, 2011, Jonathan Walters, a 17-year-old senior at Skyview High School, plotted to put a 9mm handgun to his temple. Two months earlier, his father was killed by a roadside bomb in Afghanistan, his girlfriend had broken up with him and he considered himself an outcast. Lashauna Janis, a 17-year-old senior at Senior High School, has had numerous family members, including her mother, attempt suicide. She stood by as a suicidal cousin reached out for help and instead was tossed in jail. “They don’t take suicide serious on the reservations,” she said. The campaign uses media and arts workshops to reach teenagers in Billings, hoping to amplify the topic of suicide from its current whisper to a roar so that people will take notice and help find solutions. The project is based on a similar effort in Eastern Montana called “Let’s Talk Miles City,” where a group of teenagers reached out to their peers using theater to address suicide and depression. The Billings production simulates a student who hanged herself and a student who is bullied after a saying no to drugs. It also offers a message of hope. The students will perform a Navajo poem, “In Beauty I Walk,” using Plains Indian sign language. The message is to save lives by becoming more aware, speaking up, seeking help and intervening. Lind is an international actress and director whose film and television credits include the miniseries “Return to Lonesome Dove,” and the TNT production of “Crazy Horse.” Ron Garritson, Lind’s husband, serves as stunt coordinator for the teens’ production. He is a Plains Indian sign language instructor, which he describes as “poetry in motion.” It is the universal language for all American Indian tribes. The highest rate of suicide in the state is among American Indians, 27.2 per 100,000; followed by Caucasians at 22.2 per 100,000. American Indians make up 7 percent of Montana’s population. “They have to take responsibility at a very young age for the life they see for themselves,” Lind said. 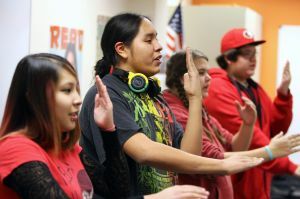 Anna DeCrane, Indian education coordinator for Billings School District 2, said the performance touches on many of the issues that lead to youth suicide, including bullying and feelings of isolation. After the Jan. 24 premiere, production is scheduled to be performed in high schools, middle schools and youth centers throughout Eastern Montana. The teens want to inspire other communities through their performances. “Let’s Talk Billings” is a project of Global Health Equity Foundation and sponsored by the Montana Idea Network for Biological Research Excellence. GHEF is a nonprofit organization that advocates on behalf of people who lack access to health education, prevention services and health care. Three original theater productions created and performed by Billings high school students will premiere at NOVA Center for the Performing Arts at 7 p.m. on Jan. 24, as part of an innovative suicide-prevention campaign using media and arts workshops to reach teenagers in Billings. Admission to the performance is free and open to the public. Donations will be accepted at the door to help sustain the project.